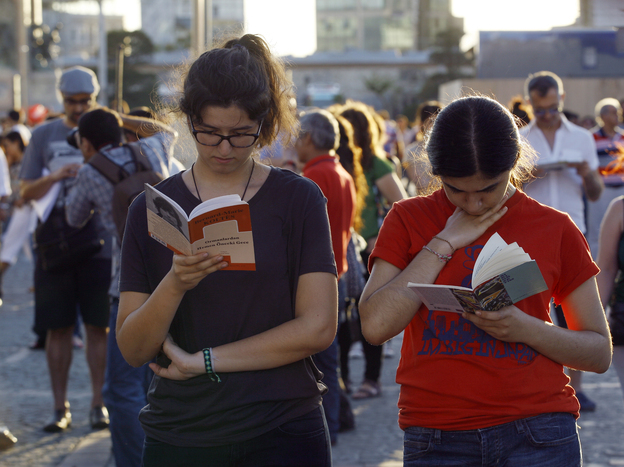 People stand and read books during a silent protest last week at Istanbul’s Taksim Square. Jane Austen might be the new face on the £10 note, says the outgoing governor of the Bank of England. , Sir Mervyn King told the Treasury select committee that the author of Pride and Prejudice is “quietly waiting in the wings.” This comes after an outcry last month over the planned replacement of Elizabeth Fry, one of only two women (!) other than the queen ever to appear on a British banknote. Barnes & Noble will its own Nook tablets, the bookstore chain announced in a press release Tuesday. The tablets will soon be, ahem, “co-branded with yet to be announced third party manufacturers of consumer electronics products.” Earlier this week, the company reported a fourth-quarter net loss of $118.6 million, up from a loss of $56.9 million at the same time last year. This entry was posted in News on 26 June 2013 .